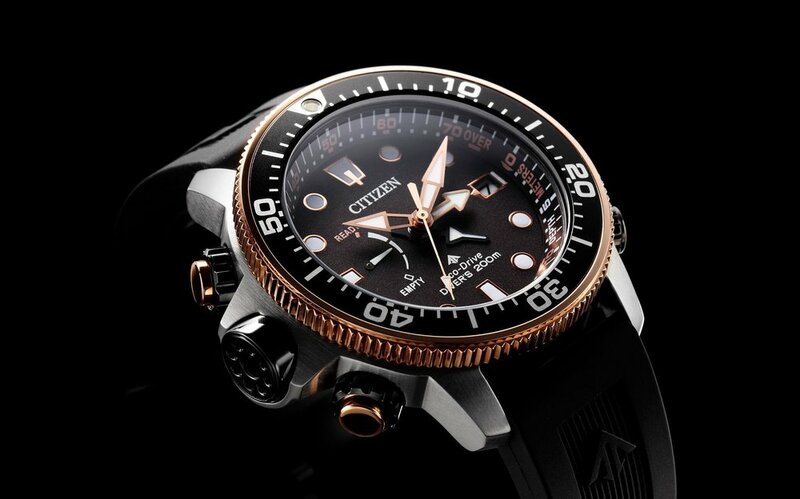 This year Citizen celebrates the 30th Anniversary of the Promaster branding. To commemorate this they announced three new limited edition models in the Promaster range. The models include models from the Sky, Land and Marine series. The first model from the Marine series is the BN2037-11E Eco-Drive AQUALAND 200m Promaster diver. This model will be a limited edition of 6000 units globally and has golden pushers, hands and rotating bezel. This is contrasted with a stainless steel case and black depth sensor module and screw down pusher locks. 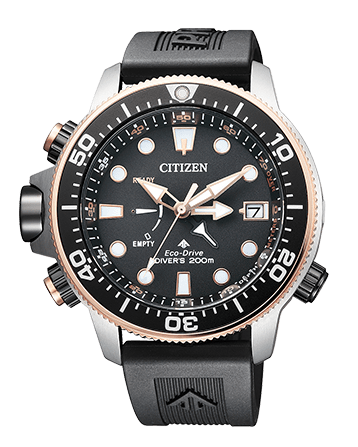 The black dial has three hands for time display along with an additional two hands that indicate current depth and maximum dive depth that measure up to 70m. The lume on the hands and dial is green for time display and blue for depth display. The case back has a Promaster 30th Anniversary logo and serial number. This model is essentially a different colorway of the existing standard model BN2036-14E. The second model is from the Land series with the Eco-Drive ALTICHRON BN4055-19L. This is a limited edition of 1989 units. 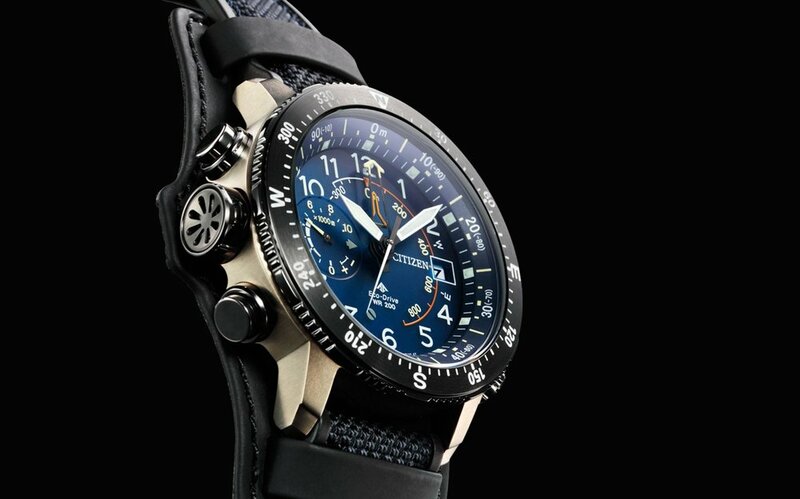 The new model has a blue dial, blue and black bund strap and yellow gold and black colored titanium case. This watch has a Super Titanium case with the new Duratect MRK yellow Gold and Duratect MRK DLC surface finishing. Duratect DLC is a Citizen material finish that instills gas into the surface of the titanium resulting in a Vickers hardness of 1,000-1,400 Hv. By comparison the Vickers hardness of stainless steel is approximately 200Hv. The new Duratect MRK Gold treatment can produce a yellow, pink or “sakura pink” gold finish with a Vickers hardness of 1,300-1,500 Hv. The Altichron model has an altimeter capable of measurement between 10,000m and -300m from sea level and this is displayed through three analog hands. The case back has a Promaster 30th Anniversary logo and serial number. This model is essentially a different colorway of the existing standard model BN4046-10X. The final model is from the Sky series with the new SATELLITE WAVE GPS PROMASTER CC7015-55E. This model is based on the F990 calibre that has been used on a number of other models previously. This calibre has the ability to connect with GPS satellites and correct the time for any of 39 different cities. The watch can display the time in two different time zones and these can be switched between home and current location. There is a chronograph that can measure up to 24 hours in one second increments. The watch can also display the current light level intensity being received. With all of these functions the multi-layer dial layout is quite complex and I personally think it appears difficult to read at a glance. The case external bezel has ground-air visual emergency codes listed and the case back has a 30th anniversary logo and serial number. These three anniversary models are nice additions to the Promaster range and I do like the Altichron and Aqualand models. 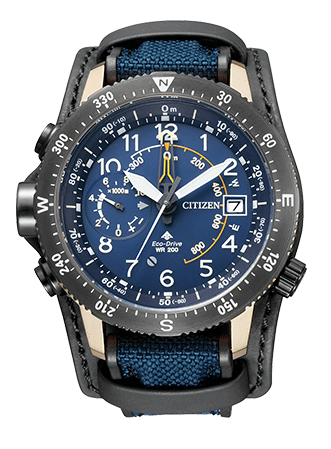 Some people familiar with the history of Citizen within the Japanese market may have been surprised by the announcement of the 30th Anniversary for Promaster. The Promaster branding was only introduced to the Japanese market in mid-1994 and it is first seen in the Citizen June 1994 Japanese watch catalog. In the previous January 1994 JDM catalog the Aqualand models can be seen under the Sporte branding. The Sporte branding utilized the now familiar Promaster arrow symbol that first appears in the 1982 June JDM catalog. While it is 25 years since the introduction of the Promaster branding to the Japanese market it was introduced five years earlier to the international market. The introduction of the branding can be seen in the advertising of the period. In the December 1988 issue of National Geographic magazine a Citizen advert can be seen with the models listed with just the arrow symbol and the tagline “The Sporting Life”. This branding and tagline had been used for a number of years with it appearing all the way back to the adverts for the first Aqualand from November 1985. The introduction of the Promaster branding seems to have occurred from the start of calendar year 1989 as adverts from March and June 1989 from National Geographic clearly show the new Promaster branding. It may have been that the Sporte branding was more recognised in the Japanese market and that is why it took longer for the Promaster branding to be introduced domestically. 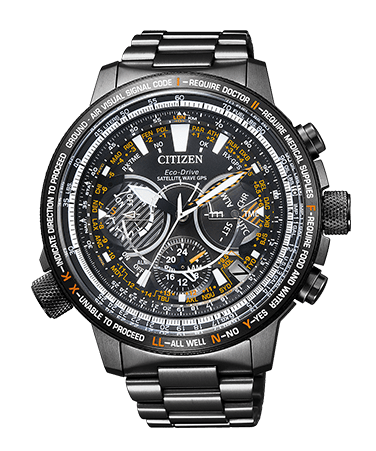 It is nice to see Citizen recognizing the anniversary of the introduction of the Promaster branding and I am sure these new models will be quite popular.